← Why did the end of July have nice weather? The United States provides these three ingredients in abundance, so it is not surprising that the majority of the world’s reported tornadoes occur in the U.S. Within the United States, tornadoes can occur in nearly every state and in every month of the year. Wisconsin has experienced tornadoes in every month except February. Tornado season is based on when the ingredients for severe weather come together in a particular place. Because a change in wind with height is closely related to the presence of a jet stream, tornado season moves north and south during the year with a jet stream. Tornado season peaks in March and April in the Southeast but not until July in the upper Midwest and Northeast. The deep South has a secondary peak in tornado occurrence in November. Tornadoes can also happen at any time of day or night. However, the most likely times for tornadoes are late afternoon or early evening. More than half of all U.S. tornadoes occur during the hours of 3 p.m. to 7 p.m. local time. In Wisconsin, June is typically the month when the most tornadoes occur, followed by July. Wisconsin averages 24 tornadoes per year. So far this year, Wisconsin has experienced only eight tornadoes. The most recent was Thursday in Deerfield. 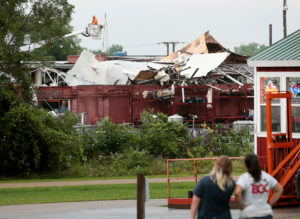 The National Weather Service determined that tornado had 80-mph winds. The storms were relatively weak, in comparison to other tornadoes, but they still caused damage and posed a danger.